Bullet journal keys can be overwhelming and confusing when you’re first starting out in your bullet journal. (See my guide to starting a bullet journal here). Sometimes even if you’ve been bullet journaling for awhile, you can still be struggling to get a key that works well for you. So today we’re talking all things bullet journal key, so that you can work through the process and create one that works for you! What is a Bullet Journal Key? A bullet journal key generally lives at the front of your bullet journal. It’s basically a shorthand code to help you simplify your task lists. With the key, a quick glance will let you know where you are in the process of completing that task. The bullet journal key is generally made up of a combination of symbols, signifiers and color coding that keep your task list organized and serve as a reference point to look back on as you create your monthly and weekly spreads throughout the year. The bullet journal key tells you what each symbol you use means. Your bullet journal key can be continually updated as you add or subtract different elements to make your system work for you, so don’t be too worried if you’re not sure exactly what you want to use yet. 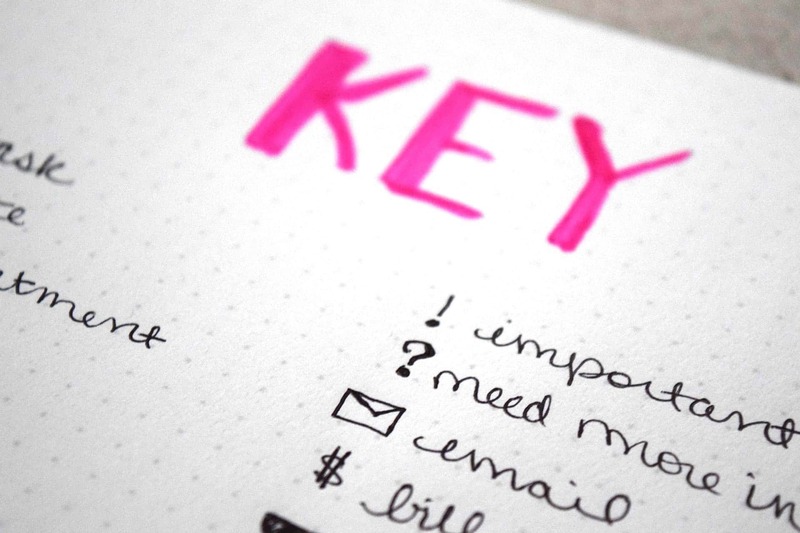 Bullet journal key symbols are simple drawings, a square, a slash mark, or an arrow that tell you what the item on your list is and where you are in the process. For example, a square can signify a new task. A square with a slash mark through it can signify a task you’ve started but haven’t finished. A square with an an “x” through it can signify a task you have completed. A square with an arrow can signify a task that you did not complete yet and needs to be forwarded to the next page. If you’re just starting out, these are common symbols used in the beginning that can help you get started. I recommend trying them and seeing how they work for you. If you need more, or need to modify them, you can always update your system and your key. Another element that you might want to include in your bullet journal system and in your bullet journal key, are signifiers. These are essentially extra symbols that you add when you want to draw attention to something. For instance if you have a great idea in your task list that you want to make sure you come back to, you might draw a small light bulb next to it. If you have a task that is very important, you may want to draw a star or an exclamation next to it so that you make sure it stays high priority when you come back to it. Bullet journal signifiers help bring extra attention to an element of your task list. To keep you organized though, especially at the beginning it’s important to list the signifiers you plan to use in your bullet journal key. As you go, if you realize you need to add more you can just return to your key and update it with new ones. Another popular way to keep your bullet journal organized and easily recognize things at a glance is using color to help indicate your tasks. The amount of colors you use is up to you. You may want to keep it simple – using only two or three colors to note high priority, medium priority and low priority tasks. Or you may want to color code different aspects of your life – blue for school, orange for work and green for home, for example. You can use your bullet journal key to keep this color coding system organized. To set up your key, you’ll want to pick a page early in your bullet journal to section off as being your bullet journal key. Some bullet journals will already have this section marked off for you, making it even easier to get started. Mark the symbol you want to use, and next to it describe what that symbol indicates. List anything out that you intend to use. Trust me, even things you think you might remember could be forgotten by the next month. I know my brain can only retain so much for so long! The point of the bullet journal key is to make sure you have everything written down as reference so you don’t have to remember it all. Then you’ll want to create a list of color swatches for your color code, and write the meaning of that color next to it. If you want to be extra organized, I recommend writing down the pen/color information as well so you know which one to reach for when you’re setting up your next bullet journal spread. If you’re a pen lover with a large collection of bullet journal pens, trust me, this will save you a headache later when you’re trying to remember which shade of blue that was! Once you’ve got all the basics down, you can decorate the page if you like! Save extra room, and maybe even an extra page for your key. As you learn the bullet journaling system you may decide to modify or add on to the system you begin with. Having space to add those changes to your original system will make it easier. Create a tab or flag for your bullet journal key page to make sure you can easily flip back to it when you need it. If you find referencing back to a page isn’t working for you, you can create a bookmark for you bullet journal that moves with you each month. That way its right where you need it. No searching for the original page. Another similar idea is creating a flip out key. It can be a simpler version of the page with the essential symbols and colors and be attached to the original with washi tape. Then as you set up your next month, you can have it visible without having to flip back and forth. Genius!